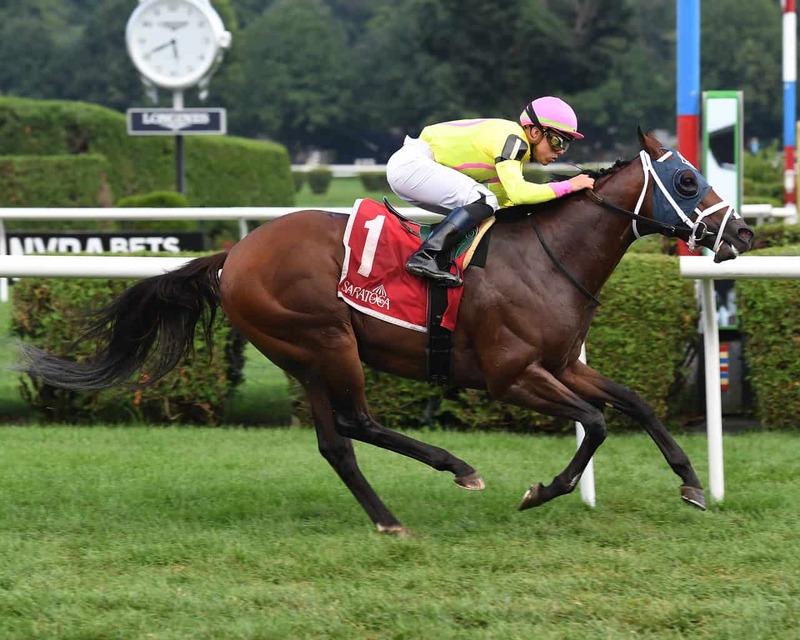 SARATOGA SPRINGS, NY – Trainer Jason Servis hit the exacta on Wednesday after World of Trouble outran stablemate Fig Jelly and 10 other 3-year-old males to win his turf debut in the $100,000 Quick Call Stakes at Saratoga. Breaking from the rail as the 8/5 favorite under Irad Ortiz, Jr., World of Trouble quickly secured command and set the pace through opening splits of :22.68 and :46.03. Still relatively unpressured as he made the turn for home, World of Trouble was able to kick away in the stretch and secure victory by 1 3/4 lengths in a final time of 1:04.11 for the 5 1/2-furlong sprint over the yielding outer turf course. The race was his first since having to scratch out of last month’s Grade 3 Amsterdam Stakes due to a fever. Fig Jelly was able to get up late from his stalking position over Dirty by a neck, while Totally Boss nosed out fourth past Stolen Pistol. The Korean-bred New Legend finished sixth ahead of Coltandmississippi, while Like What I See, Majestic Dunhill, Shangroyal, A Different Style, and Clouded Judgement completed the order of finish. Soutache was the race’s lone scratch due to being a Main Track Only entry. World of Trouble’s win was his first since romping in the $125,000 Pasco Stakes at Tampa Bay Downs in January and improved his overall record to 6-3-1-1 with a lifetime bankroll of $278,400 for owners Michael Dubb, Madaket Stables, and Bethlehem Stables. The 3-year-old son of Kantharos had his only off-the-board performance last out in the Grade 2 Woody Stephens Stakes when he finished fourth, missing third by a neck. World of Trouble returned $5.40 to win, $4 to place, and $3.10 to show. Fig Jelly brought back $6.90 to place and $5.10 to show, the Servis exacta paid $18.40 for $1, and Dirty paid $3.60 to show.